Patient comfort with cystoscopy should be paramount. Viscous lidocaine may somewhat decrease the discomfort for men, but lubrication appears to be more important for patient tolerance. The use of lidocaine has shown little benefit in women in randomized controlled trials. Adequate lubrication, gentle technique, and facilitation of patient relaxation are the most effective measures to allow tolerance of the procedure. Cystoscopy may be an embarrassing procedure for the patient. Exposure and handling of the genitalia must be performed with respect. The patient remains exposed only as long as is necessary to complete the evaluation. For more information, see Bladder Cancer, Surveillance for Recurrent Bladder Cancer, and Urine Tumor Markers. Flexible cystoscopes such as this one impose minimal morbidity and allow excellent visualization of the urothelium. Courtesy of Olympus America Inc. Different techniques are described, including "painting" the bladder with multiple passes in and out. The author prefers a "sweeping" technique when using fiberoptic scopes. The scope is advanced through the urethra under direct visualization, asking the patient to relax his "bottom" while passing through the external urinary sphincter. Immediately upon bladder entry, the scope is advanced to its greatest depth while using the thumb to retroflex it against the bladder dome. Irrigation is turned off to minimize bladder overdistention. This is more comfortable for the patient and minimizes the amount of mucosal surface area that must be inspected. It may be restarted if distention is inadequate or if debris or blood impairs visualization. Secondary deflection from the scope angling off the detrusor easily allows a bird's-eye view of the bladder base, which is the most common site of primary occurrences. In this position with slight left and right rotation, more than half the bladder is visible. If a lesion is identified, the scope may be advanced closer for a magnified view. The scope is then pulled back to the bladder neck and directed to view the floor by thumb control. Once the floor is fully visible, the scope is swept toward the patient's right side. Minor movement in and out at the bladder neck (taking care to not drag the scope over the bladder neck mucosa) allows complete visualization as the scope is swept 270°. When the scope reaches the 3-o'clock position (patient's left side), the surgeon's wrist cannot complete the circle, so the scope is brought back to the base of the bladder and the procedure is repeated in reverse. Any suggestive areas are inspected carefully, confirming the healthiness of the mucosa or noting any lesions that require further investigation or intervention. 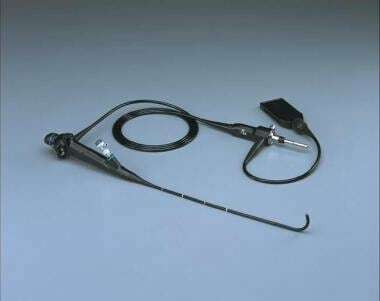 In contrast to the sweeping technique, which is most effective with fiberoptic scopes, the vastly superior optics of modern digital chip technology scopes allow visualization of the entire bladder in most patients by moving minimally in either direction when the tip of the scope sits just inside the bladder neck. After seeing the upper half or more of the bladder, the surgeon may advance the scope into the retroflexed position and can then easily visualize the basilar (or trigonal) half or more of the bladder. This offers more completeness of the examination and is better tolerated by the patient. 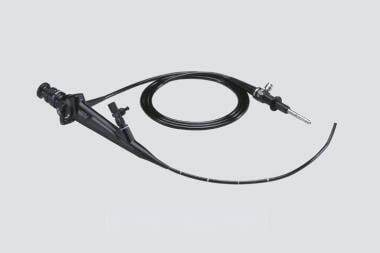 Cystoscopy in women can be performed as described for men, using the flexible cystoscope, or a rigid cystoscope (see the image below) may be used because of the relatively straight female urethra. In actuality, the female urethra also dips slightly down; therefore, placement of the rigid scope is more comfortable if the scope (with an obturator in place to create a smooth tip) is pointed dorsally as it enters the urethra and then redirected ventrally prior to entering the bladder neck, following the natural, slightly upward curve of the urethra. In order to remove the obturator without spilling urine, the scope may be placed gently against the back wall of the bladder while switching the obturator for a lens, although the surgeon must be careful to avoid causing irritation that could mimic carcinoma in situ (CIS). Note that the trigone is the most sensitive part of the bladder, so placing the scope against the back wall instead of the trigone is requisite. Once the 70° lens is in place, the bladder may be swept similarly by angling the surgeon's end of the scope away from the side of interest. In doing so, the scope (eyepiece) essentially ends up creating a conical motion, with the tip or pivot point being the urethra. The 30° lens is then able to visualize the entire bladder with effort, but the 70° lens can easily visualize the entire bladder unless the bladder is overfilled. Use of a video camera system is helpful for education of both residents and patients and allows documentation of findings. Monitoring is usually not required for patients undergoing office-based cystourethroscopy. Some urologists also believe their diagnostic accuracy is improved with the magnification and optics of the camera system. Digital chip endoscopy may be performed as easily in women as it is in men. During cystoscopy, the urologist generally obtains multiple bladder biopsy specimens from various locations in the bladder to help establish the diagnosis and to determine the extent of the tumor. A process known as bladder mapping is used for this purpose. In general, biopsy specimens are taken from the left lateral wall, right lateral wall, base, dome, and trigone of the bladder, as well as from the prostatic urethra. Adequate tissue should be obtained to allow the pathologist to determine the depth of penetration of the tumor. Usually, a cold-cup biopsy forceps is used to avoid cautery artifact to the specimen. Biopsy specimens, which are submitted in separate containers, are obtained from different areas using a punch biopsy forceps. The pathologist provides a report for each location from where a specimen was taken. In order to detect invasion into the lamina propria or muscle, the biopsies should be deep, and the pathologist should record the presence or absence of these areas. Carcinoma in situ (CIS) may not be visible, and a map of the areas where biopsy samples were obtained is helpful for subsequent follow-up examinations. At the time of this procedure, the bladder can be lavaged with saline and the specimen can be sent for cytology. The specimen should be labeled as a bladder washing or lavage to assist the pathologist in evaluation, as specimens from washings tend to have larger clumps of cells than simple voided urine. When visible, CIS may have a characteristic red, velvety appearance that resembles an area of inflammation. Obtain biopsy specimens from any areas of suspicious erythema that are not included in these biopsies, and label them as an additional site. Following tissue acquisition, the biopsy sites can be cauterized for hemostasis. Avoid damaging the ureteral orifice or intramural tunnel of the ureter. If potential damage to the ureteral orifice is unavoidable because of the location of suspicious lesions, a ureteral stent may be placed. The role of random bladder biopsies is controversial. The minimal benefit of identifying unsuspected CIS must be weighed against the risk of increasing tumor implantation plus the risk of additional bleeding or bladder perforation. However, CIS is often not visible and may be underdetected without biopsies of normal-appearing bladder urothelium. Retrograde pyelography is generally discouraged during bladder biopsies to avoid reflux of malignant cells, but the study may be performed if the patient has contrast allergies or other issues that prevent other imaging modalities for evaluation of the upper urinary tract. Ureteral washes for cytologic analysis may also be performed. These should be obtained with saline (not water) and should be collected prior to the instillation of any contrast material, which has been shown to negatively affect cytology results. Transitional cell tumors are typically papillary or sessile, and CIS may appear as an erythematous, velvety lesion. Unless the lesion is in a bladder diverticulum (pseudodiverticulum), attempt to resect the primary tumor completely. A bladder diverticulum lacks a surrounding muscle layer, and a deep biopsy of a lesion within a diverticulum risks perforating the bladder and extravesical extravasation of cancer cells. Because no muscle layer surrounds the bladder diverticulum, the next step in the progression of a superficial tumor is extravesical spread, requiring more aggressive surgical therapy (eg, partial cystectomy, open diverticulectomy) rather than a simple resection followed by surveillance. At the time of cystoscopy, ureteroscopy may also be performed, if upper tract disease is suspected. The urinary tract distal to the bladder—the shorter urethra in women or the longer urethra in men, with its prostatic, bulbar, and penile portions—must also be assessed during cystoscopy. Patients may prefer to dress themselves prior to discussing the findings or allowing family members to enter the examination room. Patients must understand that minor hematuria or dysuria is normal and expected following instrumentation. Irritative symptoms may be treated with phenazopyridine. Less commonly, anticholinergic agents may help relieve detrusor contractions. Obstructive symptoms in men usually resolve within a few hours, but urinary retention occasionally occurs. Alpha-blocking agents may be useful if administered prior to complete retention. Patients with preexisting obstructive symptoms may be given preemptive treatment. Findings from flexible cystoscopy are as accurate as those from rigid cystoscopy, and flexible cystoscopy is much better tolerated in male patients. Women experience similar levels of discomfort with rigid or flexible cystoscopy. The entire lower urinary tract urothelium should be inspected endoscopically, noting changes in the urethra and in the bladder. Obstructing benign prostatic hyperplasia should be noted because it may suggest an increased risk of perioperative urinary retention. Further investigate efflux of blood from either ureteral orifice with retrograde pyelography, ureteroscopy, or both. Lusch A, Liss MA, Greene P, Abdelshehid C, Menhadji A, Bucur P, et al. Comparison of Optics and Performance of a Distal Sensor High Definition Cystoscope, a Distal Sensor Standard Definition Cystoscope, and a Fiberoptic Cystoscope. Urology. 2013 Oct 2. [Medline]. Abrol S, Jairath A, Ganpule S, Ganpule A, Mishra S, Sabnis R, et al. Can CT Virtual Cystoscopy Replace Conventional Cystoscopy in Early Detection of Bladder Cancer?. Adv Urol. 2015. 2015:926590. [Medline]. Hougen HY, Lobo JM, Corey T, Jones R, Rheuban K, Schenkman NS, et al. Optimizing and validating the technical infrastructure of a novel tele-cystoscopy system. J Telemed Telecare. 2015 Oct 20. [Medline]. [Full Text]. Schaeffer EM. Re: flexible cystoscopy findings in patients investigated for profound lower urinary tract symptoms, recurrent urinary tract infection, and pain. J Urol. 2013 Nov. 190(5):1777. [Medline]. Medscape Reference. Available at http://www.medscape.com.